Plate heat exchangers in combi boilers are secondary heat exchangers. There are other types of secondary heat exchanger and there are some combination boilers like the Potterton Puma and Lynx or the Ferroli F24, F30, Modena and Domina ranges, or Worcester 24i Junior and 28i Junior that don’t use secondary heat exchangers at all but the majority of combi boilers do. Plate heat exchangers are a major cause of problems in combi boilers and since most combi boilers use them it’s worth understanding how they work. In hot water mode the diverter valve in the boiler diverts the heating water from the radiator pipework, sending it instead through the plate heat exchanger. There are two waterways in the plate heat exchanger, one for central heating water and one for tap water. The two lots of water don’t mix but the waterways are tightly interleaved, separated by a series of plates. The photo on the right shows a typical plate heat exchanger. It came from a Jaguar combi which is a combi manufactured for Plumb Center by Glow-worm but most combi boilers use similar plate heat exchangers. The heating water passes in through one of the ports and out of the other (they’re at the top in this picture). Cold mains water passes in through one of the remaining ports and out through the other. As it passes through the plate heat exchanger it picks up heat from the metal plates in contact with the hot heating water in the other channel; the mains water goes in cold and comes out hot, passing to the taps. The heating water loses a lot of its heat across the metal plates and is pumped back to the main heat exchanger where it is re-heated. To be able to transfer the heat from the heating water to the mains cold water quickly enough the plate heat exchanger needs a very large surface area of contact between the two water channels but it also needs to fit into the boiler so the plates are very close together. This gives a very large surface area within a small space but it also creates a problem; the small spaces between the plates are very easy to block up and this happens in two ways. Lime scale is not much of a problem in the heating waterway of the plate heat exchanger. The same water (which also passes through the radiators) simply goes round and round; the small amount of lime-scale it brought in with it will have been quickly precipitated out, mostly in the main heat exchanger. Unless the heating water system is leaking and being regularly topped up it should not be a problem in the heating waterway of the plate heat exchanger. The domestic tap waterway is quite different. Fresh mains water is being constantly brought in and heated up in the plate heat exchanger’s domestic water channel. Without a scale treatment device there can be a rapid deposition of scale. This shows in obvious ways. If the flow rate at the hot taps has become very slow (and the cold taps are still OK), the plate heat exchanger may be blocking up. (You should also check that any isolating valves in the mains water line are fully open and that any filters are clean). If the hot tap flow rate has slowed down due to lime-scale blocking only one part of the waterway, the tap water may also become very hot but temperature is not a good indicator; a general coating of lime-scale slows down the rate of heat transfer across the plates so the water may not pick up enough heat as it passes through. It may come out cooler. The domestic tap waterway in the plate heat exchanger can be de-scaled using chemicals and a de-scaling pump but it may be cheaper to replace the plate heat exchanger rather than de-scaling it. If there is a leak between the two chambers, mains water is normally forced into the heating water side, raising the pressure. If the incoming mains water pressure is high enough, the heating system pressure will continue to rise until the 3 bar safety pressure relief valve is forced open and heating water is passed out of the system through the safety pipe. In hard water areas this should be rectified as soon as possible, as the mains water entering the heating system is carrying dissolved lime scale which will be precipitated out in the hottest part of the heating system, the main heat exchanger. If this is allowed to continue the deposited lime-scale will cause serious kettling problems. The picture on the left shows a sludged up heating water port on a plate heat exchanger. In a dirty system the narrow waterways of the plate heat exchanger act like a filter, trapping the black iron oxide sludge and other debris. The flow of heating water through the plate heat exchanger is significantly (and maybe dramatically) reduced so there is not enough heat to warm up the tap water adequately. If the boiler has a modulating gas valve the flame will reduce accordingly and you will get plenty of very cool tap water but usually with a steady temperature. The more common way for the plate heat exchanger to block up is for the heating waterway to be clogged up with black oxide sludge and debris. Combination boiler manufacturers are very clear that an existing heating system must be cleaned before a new boiler is fitted. Power flushing is the best option but it is expensive and time-consuming if it is done well. Sadly, it is generally done badly if at all. Filters, cyclone type separators and magnetic sludge removers such as MagnaClean ® and Spirovent Magnabooster ® and Spirotrap MB3 ® help to clean the system but should not be used in place of proper power flushing if the system is dirty. In hard water areas there are significant amounts of limestone (mainly calcium carbonate) dissolved in the water. As the water is heated, some of the limestone is precipitated out, forming scale. Below 60°C the effects are less of a problem but as the water gets hotter, scaling increases significantly. Most combi boiler manufacturers require the fitting of some form of scale treatment device in areas where the hardness is above 200 ppm. If the gas valve is not modulating, the main heat exchanger will quickly become too hot and the boiler will shut the flame down. As it cools it will fire up again, then shut down and so on. At the hot tap, or shower, you get water which comes out warm then cold then warm then cold and so on. Cleaning the black sludge and debris out of a blocked plate heat exchanger is difficult and may be impossible. Normally the heat exchanger is replaced. Unless the sludge is removed from the rest of the system the new plate heat exchanger may soon fail too. A completely different problem with plate heat exchangers (and other secondary heat exchangers) is leakage between the two waterways within the heat exchanger. This does not show up as a leak from the boiler inside the house (unless someone didn’t fully tighten the safety pressure relief pipe). It generally shows up as leakage from the safety pipe which passes out through the wall, either a dripping or running. If the mains water pressure in your area is less than 2½ bar, it may not show up at all. The tap water channel in the plate heat exchanger operates at mains pressure. Typically this is between 2 bar and 6 bar but it can be lower or higher. The heating water side of the plate heat exchanger is at the pressure of the heating system, typically between 1 and 1½ bar cold, and 1¼ to 2 bar when the system is hot. 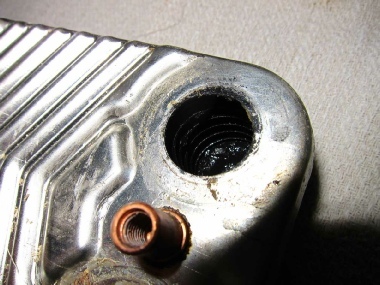 Leakage across the plate heat exchanger is not the commonest cause of an increase in system pressure or of water passing out through the safety pipe. That is more commonly caused by a failed expansion vessel. However, if the safety pipe drips or runs pretty well indefinitely, even when the boiler has not been firing, and the system pressure gauge is reading steadily around 3 bar, you should suspect the plate heat exchanger. If the plate heat exchanger is leaking internally it will have to be changed.